Not only were we supported in Leeds on Sunday 8th May by the Leeds-Bradford Hope walkers, we were also very fortunate to have been represented in the Leeds Half Marathon by Danni Torr, one of the many wonderful and determined members of Team Will’s 1000 Mile Challenge . 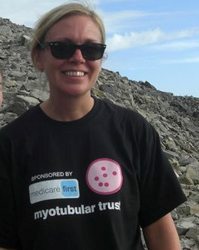 Team Will’s 1000 Mile Challenge was established when Danni and other friends and family of ‘Wee Will’ decided to take on the extraordinary task of collectively completing a 1000 mile challenge in order to raise research funds for the Myotubular Trust: to help find Will a cure or treatment. What’s more, they are already more than half way to completing their target! Danni had a few aches and pains the next day but is nonetheless looking forward to travelling back to London in July to support the 10k again. Thank you so much Danni for continuing to clock up miles for the ‘Team Will 1,000 Mile Challenge’ – we’re looking forward to thanking you personally in July!